In the span of one year, the Cleveland Cavaliers lost two-thirds of the Big Three they assembled in the summer of 2014. 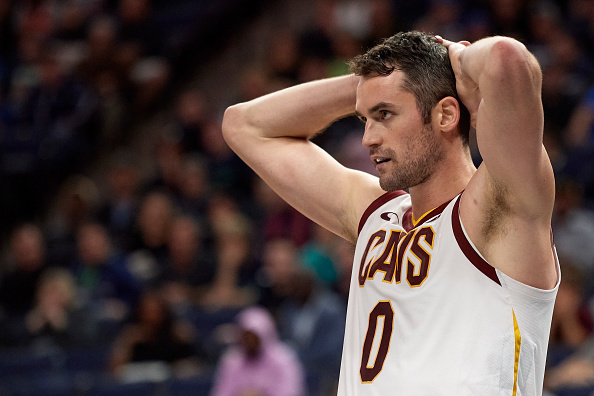 Naturally, with the departures of LeBron James and Kyrie Irving, it made all the sense in the world for the team to label Kevin Love – the last remaining star – as the face of the franchise. It’s fair to wonder if the Cavs are starting to regret this decision. To clarify, this has nothing to do with his on-court performance, the idea of building a team around him or even his current injury woes. Instead, the concerns Cleveland is feeling are rooted in the fact Love has now become the lead voice in the locker room, and he’s been airing a few opinions which go against what the front office wants to do this year. Heading into the season, the Cavs’ higher-ups were putting increased focus on developing the younger players on the roster. However, they also foolishly thought doing so wouldn’t impact the overall goal of trying to contend for a playoff spot. Said goal was reportedly hammered home with Love when Cleveland inked him to a contract extension this summer. He was told there’d be no tanking despite the loss of James, that he wasn’t being kept around to take part in a nasty rebuild. Three games into the year, Love was understandably confused when watching Cleveland’s young players get throttled by a bad Atlanta Hawks team while Kyle Korver and J.R. Smith, seasoned vets he’s played with in the postseason, never once checked in. Instead of staying quiet and letting everything play out, Love instead voiced his displeasure about the veteran players being shelved. One game later, coach Tyronn Lue scrapped this approach, getting Korver and Smith back into the rotation and going against the front office’s plan for the year. It wouldn’t be lofty to assume this played a big factor in Lue being fired less than a week later. Since the firing, Love noted Cleveland’s now-former coach was a big reason why he eventually decided to sign his extension. Additionally, he’s been vocally stumping for Larry Drew while the “interim” coach continues his standoff with the front office. The two sides are at odds about the idea of Drew spending the rest of the season running the team while being paid $1 million in the final year of his deal. Love has made it known he wants Drew to get the security he’s looking for. Seven games into the year, the team’s higher ups have already dealt with two major issues. In both instances, Love made it known he wasn’t on their side. They made him the face of the franchise, and he’s proceeded to go against what they were hoping to accomplish. There are two important takeaways to add to this. First, Love isn’t wrong. On top of this, if the Cavs are upset about the fact he’s speaking out against their plans, they need to realize they brought this on themselves. Love is unhappy. He was told there’d be no tanking, and the team already looks like it’s making plans for the draft lottery. He decided to stay in Cleveland, in part because of his relationship with Lue, who’s since been fired. He likes playing for Drew, but is watching the front office try and skimp him on a contract. In years previous, Love would handle this frustration by going into a shell and letting louder voices in the locker room do the talking. He’d sit quietly in his corner of the court while James or Irving would provide any headline-worthy material. What the Cavs are quickly learning is they’re no longer dealing with the same, shy Kevin Love. They may have assumed he’d stick to his usual routine and let any issues he had go unspoken for, but he’s making it clear that’s not how he’ll handle any displeasure this year. The most realistic result to this is Love being dealt sometime before the season ends, especially if Cleveland’s ill-advised playoff aspirations are further dashed. He has yet to hold his tongue on anything he’s upset about, so his eventually demanding a trade shouldn’t shock anyone. Until then, though, the Cavs will continue hearing their new face of the franchise voice displeasure when they make decisions which go against what they promised him this summer.